Paw Paw River County Park in Watervliet could be getting a substantial expansion. On Thursday, the Berrien County Board of Commissioners approved the purchase of 63 acres of property adjacent to the park. The Berrien County Parks Department tells us the parcel owned by the Enders family is across the river from the island that makes up a large part of the current park. They’ve been working with the Enders family to acquire it. 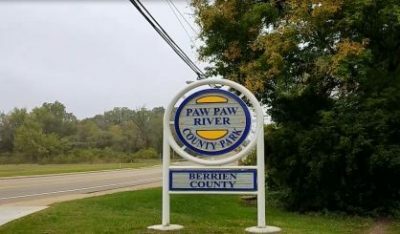 “They have an interest in the property becoming part of Paw Paw River County Park, they were pleased with how the first phase of Paw Paw River County Park turned out, and they’re willing to work with us on a Michigan Natural Resources Trust Fund Grant application,” said Berrien County Parks Director Bryan Bailey. The county board has authorized the parks department to spend $3,000 as a sort of down payment on the 63 acres while a state Natural Resources Trust Fund Grant of about $75,000 is sought to finalize the purchase. The parks department would pay about $25,000 more, making the total cost about $100,000. Bailey says the grant application will be submitted in April and a decision is likely in December. The sale could be closed in the summer of 2020. The current size of Paw Paw River County Park is 14 acres.